The Urban Interest Association Alfafar Parc has entrusted Evercom with the development of its communication plan in order to contribute to the commercialisation of one of the biggest business parks in Spain nowadays. Since June, Alfafar Parc is home to the first IKEA centre in the Valencia region. Now, in this second phase, the aim is to continue attracting new flagships to the park in order to increase its visibility and to generate allure among medium-sized stores. To this purpose, Evercom will drive the communication and the relations between the media and Alfafar Parc. The agency has also created a webpage with business facts and general information to contribute online to the commercialisation and the visibility of the park. In fact, two new contracts have just been signed. The first with Establiments Viena – a quality fast-food chain based on traditional European recipes- and the second with Ofiárea – stores specialized in stationery, school material and reprography. The plan has been designed by Evercom’s B2B Communication division, who will implement it together with Quick Expansion, the company in charge of the commercialisation of the spaces. With a total surface of 223,000 square metres, Alfafar Parc is currently one of the biggest parks in the course of commercialisation in Spain. Located 8.4 km away from the centre of Valencia, it has a predicted attendance of 3 million visitors per year. Located in Alfafar, a town 8.4 kilometres away from the centre of Valencia, the park is in an influence area of nearly two million people when adding those living in the capital and those in the neighbouring villages. It has direct access from both directions of the V-31 motorway. The traffic plan has meant the construction of 98,000 square metres between paths, car parks and overpasses. Alfafar Parc is a sustainable business space thought to be balanced, not overcrowded. It is mainly destined for medium-sized stores, becoming thus part of the most promising trend currently on the market. The International Nut & Dried Fruit Council (INC) will entrust Evercom with the design and implementation of its International Communication Plan. Evercom is one of the leading independent consulting firms in the Communication and Public Relations field in the Spanish market. Evercom wins thus the tender to manage an account that involves the design and implementation at an international level of the Annual Communication and Public Relations Plan in America, Africa, Europe, Asia and the Pacific. An ambitious project which will draw special attention to the pillars of corporate comunication: product, health and science. The plan also encompasses the communication of the participation and organization of different international congresses and forums, such as the ‘XXXIV World Nut & Dried Fruit Congress 2015’, which will take place in Antalya (Turkey). Alberte Santos, CEO of Evercom, highlights how valuable the ability to manage a global international project with an interdisciplinary team is. He also underlines that the synergy between the agency and the INC is solid in the area where the latter’s headquarters are. “INC’s project is one of the most interesting communication challenges at the present time. It is undoubtely a great opportunity to strengthen the communication of one of the most important councils worldwide and to reinforce its position as leader in research”. The International Nut & Dried Fruit Council (INC) has its headquarters in Reus (Tarragona, Spain) and groups nearly 700 professionals of the nut sector throughout the five continents. Together, they represent 70% of the sector’s world industry. Funded in 1982, the INC focusses its activity on several tasks: the innovation of production techniques, the research and study of consumption and safety trends, the encouragement of nut consumption worldwide and the aim to continue to be a reference at an institutional and marketing level, guaranteeing high-quality standards and monitoring procedures. The INC is the international nut and dried fruit reference in terms of health, nutrition, food safety, trends, sector statistics, research and governmental regulations. All in order to guarantee the international trade standards. 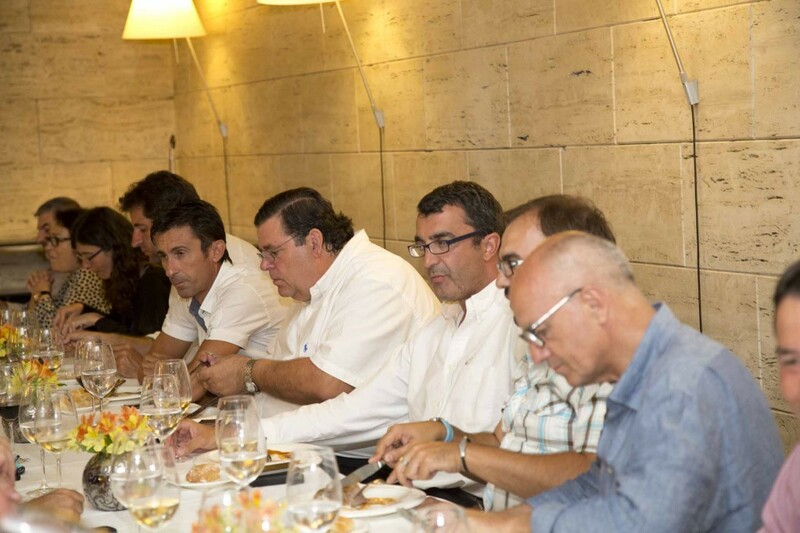 On Saturday 6th of September in the Restaurant Casa Fermín in Oviedo, the dinner organised by evercom and Cofidis to greet journalists and organisers of the Vuelta a España took place. After stage 14, journalists from Marca, As, TVE, Onda Cero, RNE, El Mundo, El País or Periódico de Catalunya met in an event that is gaining more renown each year. Some important Vuelta organisers also attended. The dinner was relaxed and friendly and caricatures were given to the guests. These showed the attendees riding bicycles while wearing the Cofidis kit -the characteristic red jersey- and were the highlight of the evening. 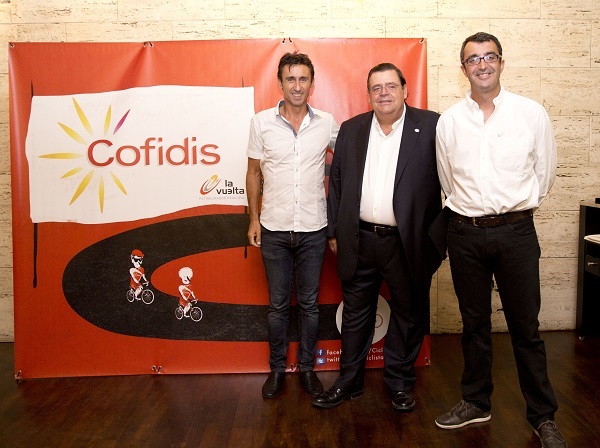 One more year, Cofidis had hence the opportunity to strengthen bonds with the communication professionals that day after day broadcast one of the most important Spanish sports events: the Vuelta a España. On the 9th of September, Loreta Enríquez, one of evercom’s consultants, took part in the program “Blogosfera’ of Onda Cro (PRNoticias group). In this new radio show, Loreta revealed they keys to go beyond “one shot” at an event with celebrity. She also explained how to make the most of a collaboration agreement between a celebrity and a brand so that the presence of the famous person is not merely incidental. To listen to Loreta Enríquez, click here. 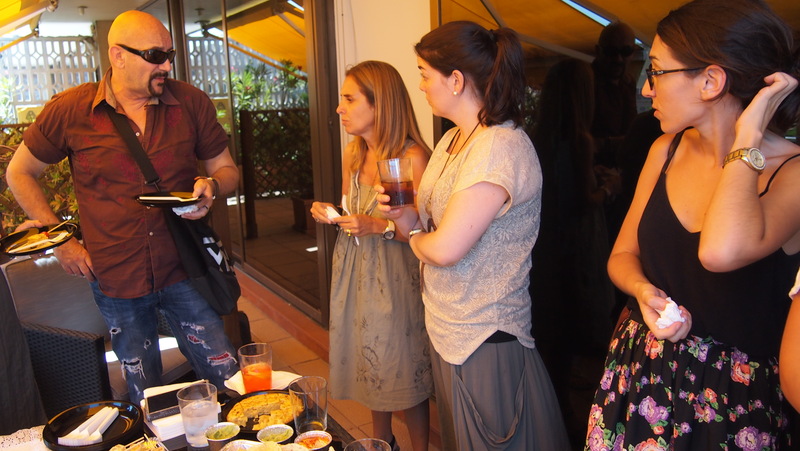 Last July, we organised the first everMUT in the exteriors of our Barcelona headquarters. 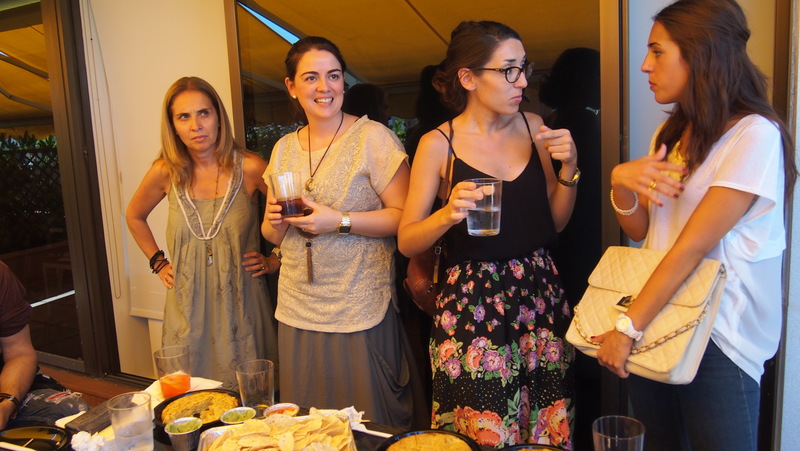 The goal of this relaxed and friendly get-together was to meet in person the journalists we usually work with and enjoy a great cocktail together. The event was held in two sessions, the first one being on Thursday, July the 3rd. 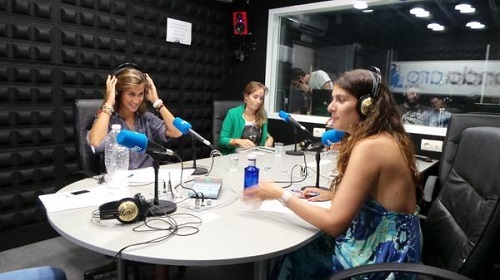 The finantial and society sectors and important Barcelona communication media were well represented in this first encounter, with nine journalists in total. Some of these media were La Vanguardia, 8tv, Btv, Condé Nast and Vanity Fair. The second session took place on Thursday, the 17th of that same month. This time, we enjoyed the company of ten colleagues of the fashion and lifestyle sectors, as well as that of influential bloggers. We had among us representatives of Mens’ Health, Women’s Health, Stilo.es, Noticias.dot, Woman, Sexologies, Marie Claire, and of the blogs The Stylist Book, Laflorinata & One Thousand Shoes. 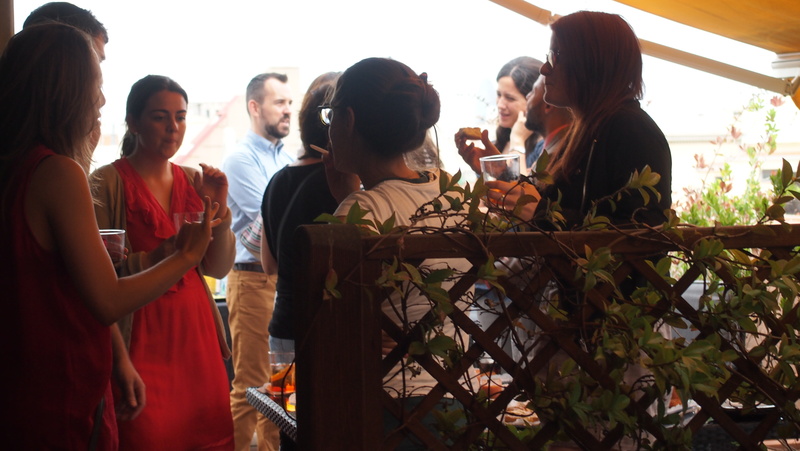 Our idea of celebrating the begining of the summer with an everMUT was warmly welcomed by the attendees, who enjoyed the views that the terrace of our Barcelona offices offers. It was a great opportunity to strenghten our ties and celebrate the good bond we already have. 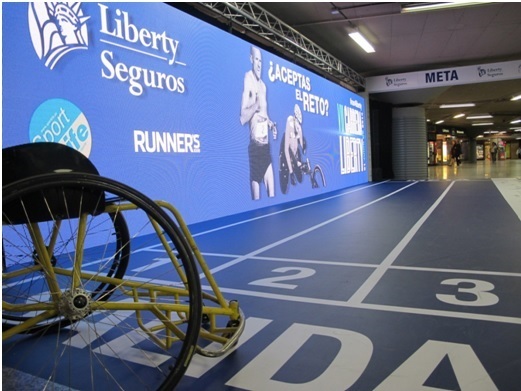 Liberty Insurance’s commitment to the integration of disability was reflected on a giant screen at Madrid’s Atocha station from the 26th to the 30th of May. Thanks to the Liberty, the famous fun run, an innovative social responsibility initiative has been developed. The station has become a giant racetrack with a ten-meter screen in which all citizens have been able to duel with Olympic and Paralympic athletes. The Liberty Challenge Race has turned the lobby of Madrid’s central station into a virtual running track. The giant 10-meter screens playing recreations of different athletes, with and without disabilities, training for the Liberty. The participanting citizens were able to run alongside these athletes simulating their same conditions in a duel in which their characteristic effort and desire to excel has been shown. Athletes who participated and those who were dueling with citizens were Chema Martínez, Olympic champion; Álvaro Encinas, wheelchair athlete; Jairo Ruiz, triathlete with physical disability and Gerard and Mark Blanquiño Descarrega, athlete with visual impairment and guide. Citizens and travelers who crossed the Atocha station that week were able to participate in this challenge and take home a souvenir. 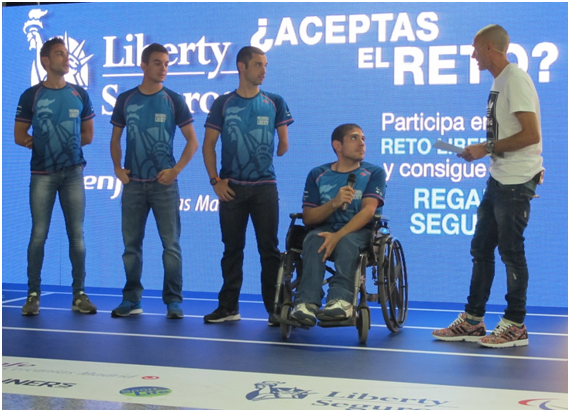 Thus, the challenge became the perfect presentation for the massive Liberty Race held last Sunday in the streets of Madrid. Just over two years ago, Banca March began a process of expansion in Catalonia to grow organically in that region. To support its local expansion, the Banca March Catalunya regional team decided to make communication its visibility and reputation lever, something they needed to expand the business. They chose Evercom as their partner agency for the project. ZEISS, one of the world’s leaders in medical technology, launched a pioneer initiative in the Spanish market, ZEISS Marcom Service, a communication and marketing service for eye clinics using ZEISS technology. It is an initiative driven from the Marcom ZEISS Iberia Management and which responds to the company’s firm commitment to become a true business partner to its customers: the most reputable clinics in Spain. The initiative provides a comprehensive support service aimed at strengthening their reputation, notoriety, patient attraction and loyalty management. It also provides them with better tools and communication channels for business. For the implementation of this innovative service, ZEISS Iberia will rely on the experience and know how of the B2B Evercom Division. This division’s role encompasses everything from the design of the strategy and the comprehensive plan of action for each clinic to the tactical execution itself, always in coordination with Marcom ZEISS Management. Hence, the service ranges from the creation of identity arguments, ad hoc-elaborated websites or audits to enhance the corporate image to brochures about the various treatments offered, events with prescribers, name creation, corporate identity and even media campaigns. Moreover, and also in collaboration with Evercom, the new ZEISS Marcom Service is especially focused on helping clinics to promote the advantages of the new ReLEx smile technology, the most advanced technique in refractive surgery for the correction of myopia and astigmatism in the world today. As a result, business in the clinics that use this technique will be strengthened. Evercom is the global communications agency for ZEISS, managing its external communication & PR strategies, internal communication and advertising. The second edition of Madrid Games Week will be held in the capital of Spain from the 16th to the 19th of October 2014. This year, the largest Spanish videogame fair has brought its date forward to be in sync with the international calendar of major videogame events such as Milan Games Week, Paris Games Week or Eurogamer Expo in London. Once again, Evercom will work with IFEMA in the communication strategy, as it did in the successful first edition. The Spanish videogame association (AEVI in its Spanish acronym) will play the fair-promoter role again, with IFEMA leading the organization and Evercom supporting the global communication strategy of the event. Over 52,000 people attended the first edition to see the industry’s latest creations firsthand. Among the main objectives of this new edition is increasing the number of visitors and participating companies. Evercom will also design the conferences featured in the AEVI Forum. This official space allocated to the discussion of the fair will have a table specifically dedicated to the world of development. In essence, Evercom will help broadcast the event and thereby contribute to the positioning of Spain as international videogame model. In addition, it will enhance at a national level the visibility and the objectives of AEVI (previously aDeSe) as an umbrella association for all the participants of the industry, including the world of development. 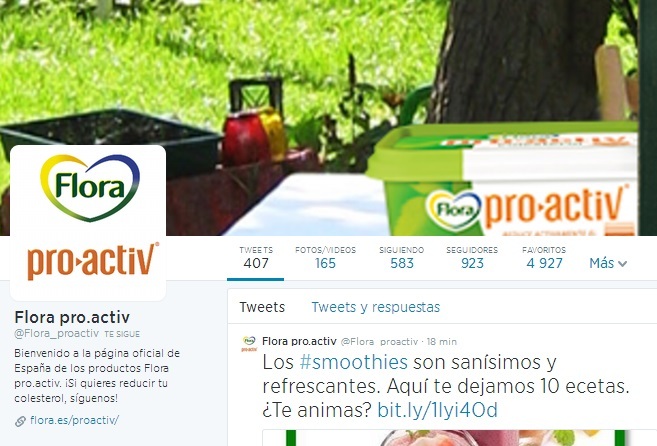 Unilever has chosen Evercom to manage and boost the social media profiles of its brands Flora and Flora pro.activ. The Consumer & Health Division of evercom, coordinated from the Barcelona office, will be in charge of the community management of both brands of margarine, one of the most important business divisions in Unilever. Evercom has continued with the work in social media initiated by Unilever to bring the brand Flora to the consumer. In addition, the agency has created a specific profile for the brand Flora pro.activ in order to reach the target audience and consumers of each brand through their own and distinct profiles. Evercom has been working with Unilever since January 2014 and does so with the goal of increasing and consolidating a community which finds in social networks its meeting point with the brand, its products and its values.